Do you move or improve? It’s the age-old quandary faced by home owners across the country. But with stamp duty at an all-time high and the property market proving unpredictable, to say the least, the argument for staying put is proving more and more persuasive. If you do decide to invest in your home, it’s important to make the right choices to create a stylish update which will be reflected in the value of your property. So where to start? 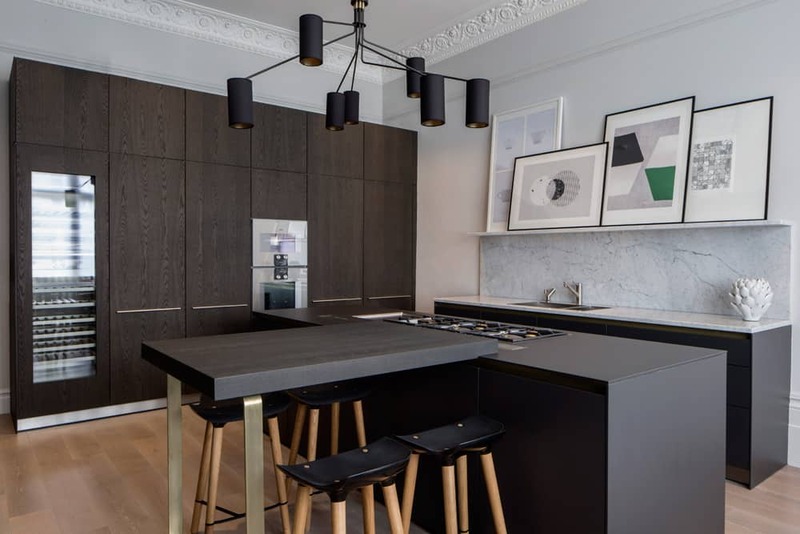 We look at the key areas of the home to focus on with a view to adding value as well as creating a stylish update you and your family can enjoy for many years to come. It used to be that the kitchen was the focal point of any home renovation, but remodelled bathrooms have now come to the fore, representing a chance to create a stylish refresh featuring unusual materials and bold colours. Using natural materials and textured finishes can completely transform a traditional bathroom into a cool, contemporary space that radiates elegance and luxury. To create a bathroom with real character, delve into the dominant trends for statement wallpaper, bold sconces, graphic tiles and matt black fixtures to add drama and sophistication. 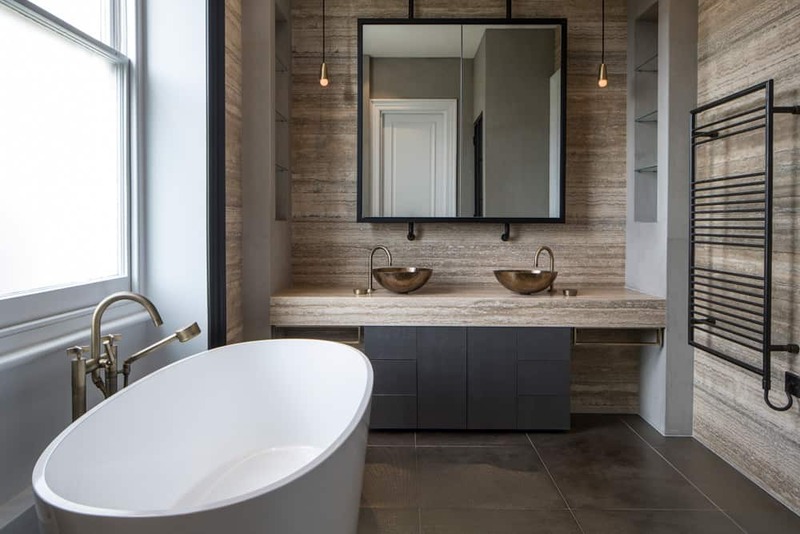 For our Antrim Grove project, the owners were keen to redesign their bathrooms to reflect a modern, industrial style with an emphasis on luxurious textures. This guest bathroom features silver honed Travertine flooring and a bespoke basin made from Pietra d’Avola, a rich, chocolatey limestone. 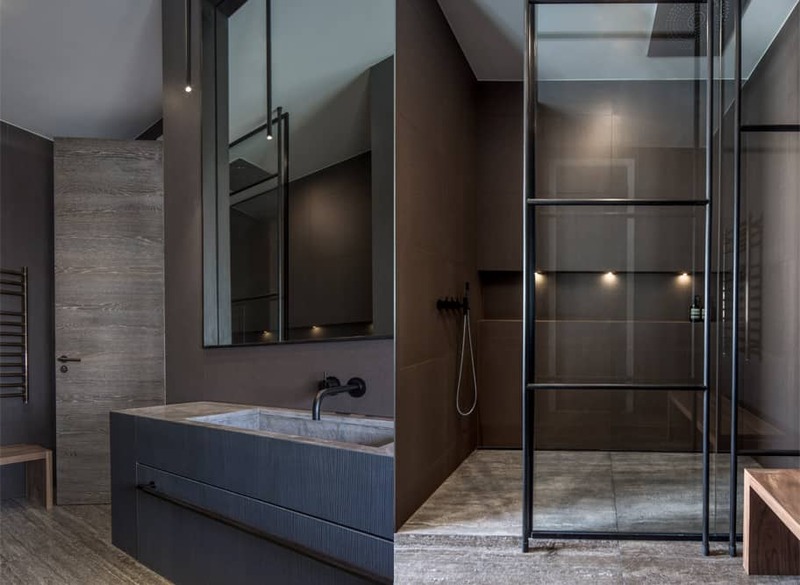 The matt black tubular lights complement the modern black faucet and the crittall-style shower screen. Our clients were delighted with the end result as it was exactly the kind of timeless, industrial-luxe style they wanted to achieve. The kitchen remains the heart of the home and as such this room will always benefit from a carefully-planned update. 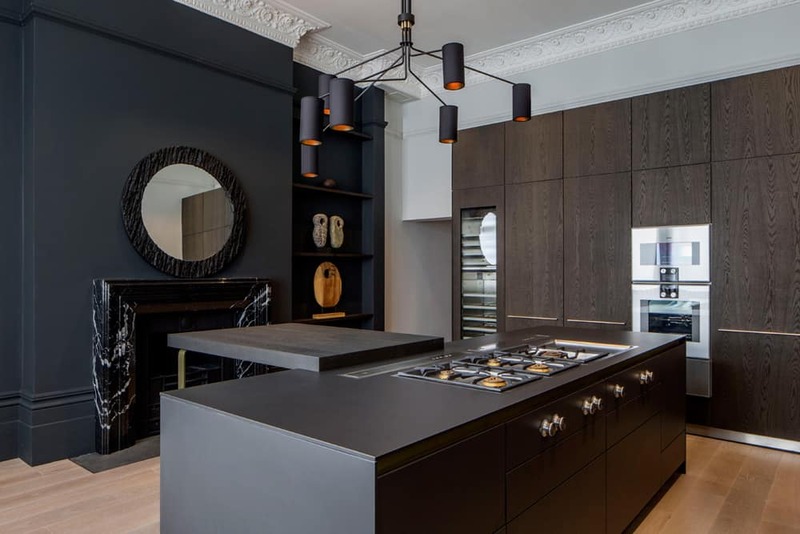 Reflecting the latest trends for stone finishes, clean lines and dark tones is a surefire way to create a new look which will make a real statement while also appealing to potential future buyers. Increasingly, the kitchen is about much more than just cooking and eating. Our clients often want to create a space which they can really cherish and enjoy, because they know they’re going to be spending a lot of time in this space, socialising and hanging out as well as preparing meals. 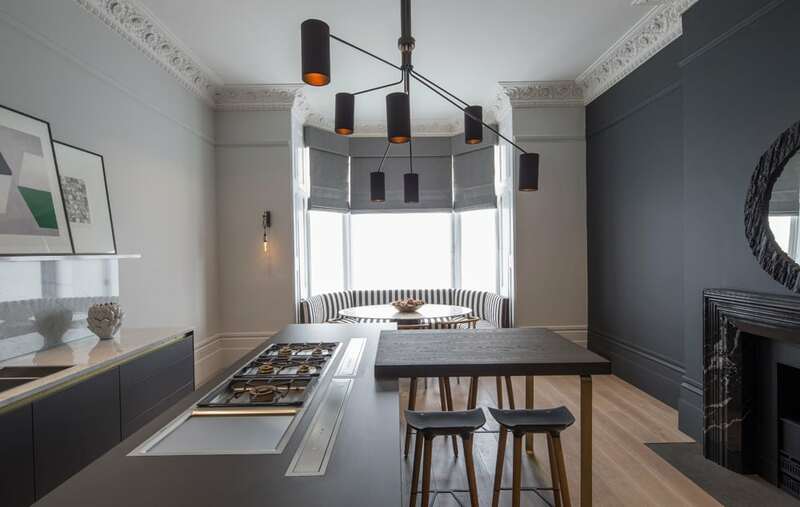 In the case of our Belsize Park project, our clients wanted to create a contemporary look while celebrating the room’s incredible period features – high ceilings, ornate coving and an incredible marble fireplace. The beautiful bay window felt like a natural choice for banquette seating, and we decided to restrict the cabinetry and most of the appliances to just one wall to helps retain the room’s dramatic proportions. The dark brown oak veneer doors create a ‘gentleman’s club’ vibe, while the strips of bronze in the handle recesses give a pleasing metallic touch. Loft conversions provide the perfect opportunity to add value to your home by creating an additional room such as a bedroom suite, home office or even a kids’ play room. And if you have the space, why not consider adding an attractive extension such as an orangery? An orangery is a win-win solution providing a sense of the outdoors with the advantage of it becoming an additional room within the home. Like any other kind of extension, it adds to the square footage of your home which will increase its value. But the advantage of an orangery over a conservatory is that its structure incorporates more brickwork which gives increased privacy as well as providing improved insulation. Another great way to invest in your home is by repurposing a room. The creation of an additional bathroom or ensuite is an effective and relatively inexpensive way of increasing your property’s value while at the same time adding a fresh injection of luxury. In the case of our Belsize Park project, the stunning master bathroom was created by transforming an existing bedroom and stealing space from a hallway. Our brief for this project was to create a sophisticated bathroom with an industrial look, steam shower, bath, double vanity and lots of natural stone. The stripy stone we used on the vanity unit and walls is Honed Ocean Black Travertine which provides real warmth and character. The taps and basins were very carefully chosen. The Watermark taps have a vintage brass finish which really complements the overall palette. The result is a scheme which is completely personal to the clients’ requirements yet also has a distinctly hotel feel. The clients were absolutely delighted with their new bathroom and it has no doubt added value to their beautiful home.